Statistics Canada, one of 13 federal departments and agencies taking part in the Paperwork Burden Reduction Initiative (PBRI), has completed the baseline count of administrative requirements and information obligations with which businesses must comply. The methodology followed instructions provided for choosing the appropriate in-scope documents and counting the relevant fields. The total baseline count for Statistics Canada is 11,019 requirements, with 75 stemming from the Statistics Act and the Corporations Returns Act and 10,944 from forms. The implementation deadline for the 20% reduction is October 27, 2008. PBRI is one of the many initiatives adopted or developed by Statistics Canada in our long history of working to reduce the paperwork burden for respondents, both businesses and individuals. Statistics Canada recognizes that the goodwill of survey respondents is one of our most valuable assets, since the continued co-operation of Canadians enables us to turn survey results into reliable information. The first is to protect the confidentiality of information provided to us. The second is to find innovative ways to reduce the time spent completing surveys and to use existing information whenever possible to minimize the number of surveys. Indeed, a declining trend in response burden, particularly for small business respondents, has been achieved over the years. Thirteen federal departments and agencies are participating in the Paperwork Burden Reduction Initiative (PBRI). The objectives of the PBRI are consistent with those of Statistics Canada and build on our previous internal efforts to eliminate duplication, ease the reporting burden on businesses, improve and facilitate response to surveys, and demonstrate accountability. The Ombudsman for Small Business Response Burden is pleased to report that Statistics Canada met the PBRI deadline of August 24, 2007, for completing the baseline count of administrative requirements and information obligations with which business must comply. Below is a description of the methodology used in establishing the count, a list of the surveys included in the initiative, and a summary of some of the many complementary measures that are currently in place at Statistics Canada. Includes all information requirements (number of fields x number of submissions) on government forms associated with A or B. Count all requirements that place a prohibition or that require a business to undertake a set of activities in order to be in compliance with government rules. Requirements also include data fields on forms. Be all inclusive in counting requirements and obligations, but exclude obligations that do not pertain to business. Count those requirements that your department and agency places on business as a result of federal statutes and regulations only. Do not include those requirements that are derived from international or provincial legal obligations, agreements, standards or similar entities. Seek clarification in cases of uncertainty. = a total of all information requirements (number of fields x number of submissions) on Statistics Canada forms associated with A or B. Statistics Canada’s Integrated Metadatabase (IMDB) maintained by Standards Division, was used to identify all active business surveys as of November 1, 2006. Most business surveys conducted at Statistics Canada are input to the Federal–Provincial Fiscal Arrangements Act; the Bretton Woods and Related Agreements Act; the Special Data Dissemination Standard (SDDS) with the International Monetary Fund; and the Comprehensive Integrated Tax Coordination Agreement (CITCA) related to the harmonized sales tax to name a few. Discussions were held with representatives from the 15 survey program divisions that conduct business surveys to review the list of 381 forms and update both the IMDB and the 2006/2007 User/Uses Program Review document. Survey identifiers were mapped to this document and this mapping will be maintained by Finance Division on an annual basis. The Census of Agriculture was excluded from consideration under PBRI because it requires Cabinet approval every five years. The total baseline count for Statistics Canada is 11,019 requirements, with 75 stemming from the Statistics Act and the Corporations Returns Act and 10,944 from forms. This count was derived by multiplying the maximum number of fields on each form times the number of submissions/frequency. Industrial Water Survey: Fossil Fuel and Nuclear Power Generating Plants. Survey of Suppliers of Business Financing (long form). Workplace and Employee Survey: Employer questionnaire. Statistics Canada confirmed that surveys conducted on a contractual basis for other departments were not reported on the sponsoring departments’ PBRI baseline count, so they are included here. customizing response arrangements for large firms who must participate in many surveys. The measures described below highlight Statistics Canada’s achievements in response burden reduction initiatives. We take response burden seriously. Included in our annual Departmental Performance Report is a quantitative estimate of total response burden hours calculated annually as the product of (i) the frequency of each survey, (ii) the average time it takes a business to complete the questionnaires and (iii) the number of surveyed respondents. In 2006, total response burden hours remained unchanged from 2005, maintaining the large reductions achieved in previous years. 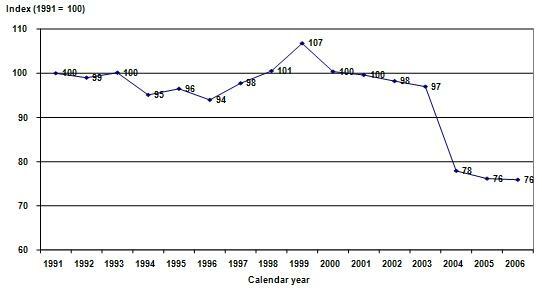 While absolute response burden hours have declined by 24% since 1991 (Graph 1 below), over the same period the average burden placed on each Canadian business has declined 39% (Graph 2 below). Statistics Canada significantly reduced the reporting burden placed on small businesses—for this group of businesses, burden is down 38% since 2000 and 43% over the last 14 years. For the last several years, Statistics Canada has been using administrative records from the Canada Revenue Agency (CRA) to replace statistical data collected via survey questionnaires. The CRA information of greatest value for statistical purposes is income tax records for unincorporated and incorporated businesses. For monthly and quarterly surveys, administrative files from the goods and services tax are being exploited. The increased use of administrative data in lieu of direct surveys of respondents has resulted in a very substantial reduction in response burden, especially for small businesses. Statistics Canada applies an exclusion threshold to its business surveys, ensuring that the smallest businesses in Canada are not contacted by Statistics Canada. In the annual survey program measuring economic production, this revenue threshold is set to exclude the smallest businesses that in aggregate account for 10% of activity in an industry and province. This means that for the million businesses that could be surveyed in this program, over 700,000 will never be contacted by Statistics Canada. The number of questionnaires sent to businesses has decreased 25% over past four years (net sample x frequency). Statistics Canada is presently taking action to raise the prescribed exclusion thresholds applicable under the Corporations Returns Act with the aim of cutting the number of corporations required to provide this information by about 40% while still maintaining the quality of the information collected on foreign control of Canadian industry. in response to the call by the Joint Forum on Paper Burden Reduction on Small Businesses. The position of Ombudsman for Small Business Response Burden addresses complaints relating to excess burden. The Ombudsman’s office also works closely with associations like the Canadian Federation of Independent Business in dealing with complaints from the small business community. The Holistic Response Management Strategy, devised in 2004, acknowledges the need for different response management strategies for different types of respondents. A key component is the Enterprise Portfolio Manager (EPM) program, responsible for the largest businesses—the ones that are in most of our surveys. This program is designed to make custom-made arrangements with each of these large respondents for collecting the very large volume of information we need from them. The goal is to form long-term relationships with respondents from the largest and most important businesses in Canada in order to manage their response burden and maintain an accurate profile of their business operations. Statistics Canada has also been taking measures to streamline the content of business surveys. The level of commodity detail collected in the Annual Survey of Manufactures was reduced by almost 90% when the questionnaire was redesigned three years ago. The content of survey questionnaires is regularly reviewed with help from focus groups. Statistics Canada works with the Canadian Institute of Chartered Accountants to align survey content with business accounting standards. Statistics Canada is an active player in the Government On-Line (GOL) initiative and has taken action to increase electronic reporting options for business respondents as a way of providing them with additional flexibility in how they meet their reporting requirements. We have co-operated with other departments and continue to do so, in an effort to eliminate any duplicate reporting requirements. Statistics Canada’s triennial Survey of Regulatory Compliance Costs is an important component of the PBRI. It provides benchmark data on the current cost of regulatory compliance for small and medium-sized businesses in meeting key information obligations that are the responsibility of various levels of government. It focuses on administrative compliance requirements such as completing forms and reporting information. Data released on July 28, 2006, focused on the internal cost of compliance; data released on December 12, 2006, examined external costs related to 11 key government information obligations. Internal costs included the time and salary of internal staff involved in the preparation of regulatory submissions. External costs included the outsourced services of accountants, income tax specialists and payroll service providers to comply with the businesses’ reporting obligations. Statistics Canada is committed to meeting the 20% response burden reduction target and has created a steering committee of senior managers to monitor progress and provide guidance.